Hi Morgan .. that's fantastic - and how inspiring to have David's book in your hands and in front of your eyes for them to read his magic. I really need to take a year off and just read books - I read what I need to find out .. but books per se ... seem to allude me and it's something I must address. I'm reading an ARC of WOVEN to my hubby right now too! It's sooo good! The White Dragon inspired me to be a writer. It's been years since I read it, so maybe it's time I picked it up and read it again. I need to get back to writing. I've been editing the series I first published in 2011. It was cleaner than I expected. But getting through the last edit pass of book four is killing me. If I write anything more, I will definitely need some inspiration. Totally jealous of Woven!! And this makes me want to go and read more of A Wrinkle in Time--one of my books that gets me inspired :) Wonderful post!! Super jealous Morgan. Being inspired is important. We both got to read an ARC of our buddy's book, and that was a fun change of pace (Western non-fiction). There's not a lot of great humor fiction out there aside from the likes of Terry Pratchett and Christopher Moore so often I'll watch a well written comedy show/movie to help inspire my writing. Although reading other writers' books can sometimes lead to jealousy or a feeling of inferiority, they also inspire me to try even harder to put my ideas onto paper. Kind of a love/hate relationship. Yep, I'm jealous. And yep, it's been forever since I've read a book simply for the pleasure of it. Le grande sigh. Also, we need to hang out. I'm practically exploding with writing angst. So cool! Okay, yes a wee jealous. I do love those books that get my creative juices flowing. Reading amps up my muse for sure! I loved Woven too. Very true, reading others can sure help us step out of our world and maybe embrace something new along the way to. Good for you, Morgan. I went through the same thing. I'm still picky about my fiction, but I don't grab for my red pen like I used to. What a wonderful idea to go back to those magical books we loved so much. I think I will do that as well, especially as one in particular came to mind when I read your words. The magic, the different world. I loved the writer's skill with taking me away to another place. Thank you Morgan, for the prompt. The only thing that has changed about the way I read is by changing what I read. By that I mean, as I have read better books, it has created an impatience within me with books that aren't "better." It's always been that way with me. Writing didn't change that. I didn;t know David was writing a book. I'll be sure to look for it when released. And I'm going to reread the entire Harry Potter series after the holidays are over. Why not. That was such a fun journey. Awesome! Have fun reading Woven! I often get inspired by listening to music or catching a good movie too. Maybe the conflict strikes a chord with me and gets me thinking. Yep, a bit jealous that you're already reading Woven. I tend to book binge. I'll read and read and read and then I'll take a break from reading for a while. I love when I'm reading something and it inspires me to write. For me the mark of a good book these days is if I can turn off my inner editor while reading it. It's become second nature to pick books apart, so I love it when I forget about that in favour of enjoying the story instead. I'd have to say the last book I read that made me want to write is HEIR OF FIRE by Sarah J. Maas. Incredible world building, plot, and character development! Great post and congrats to David on his upcoming book release! 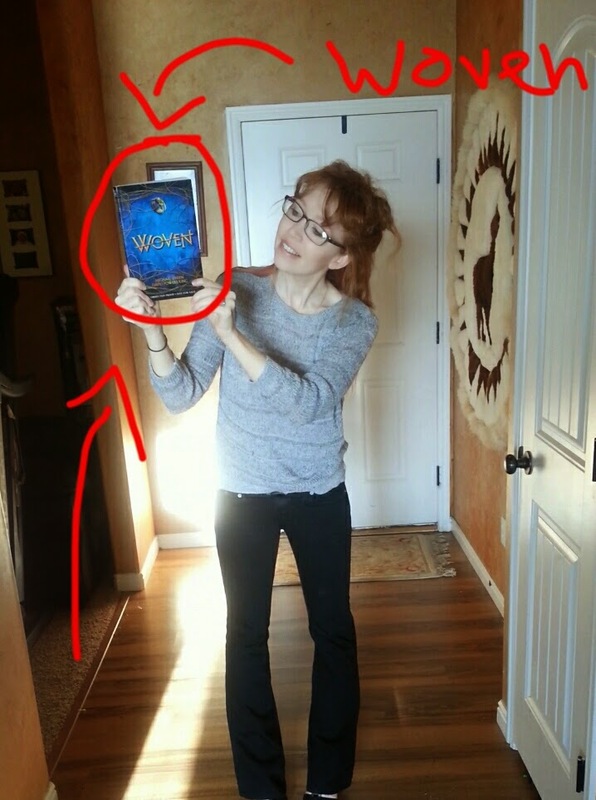 Lucky you getting an ARC of Woven! Reading inspires me. I find myself returning to favorite writers again and again. Those are the ones where you get lost in the story and don't even think about critiquing and editing. Then I go back and try to figure out what it is about the book that hooked me so. There must be a magic formula! LOL. Since I became serious about writing for publication, it's also been hard for me to turn off my inner editor when I read a book. It amazes me what gets published these days, when there are so many things modern writers are constantly being told not to do. Reading older books also saddens me sometimes, thinking about how they never would've gotten published these days. I can almost hear agents, editors, and critiquers saying things like "Watch that word count!," "Too much telling!," "No opening hook!," and "There's no one main character!" Yes, totally jealous you're reading Woven right now! I love reading - so many books and authors have inspired me. The last book that inspired me to write was actually a very disappointing book that left me feeling that I could do much better. I haven't actually gotten around to writing that better book, but it did inspire me. Morgan, the blank page actually scares me! But I overcome that fear and soldier on. I read for fun but also pay attention to what I can learn from other authors. The latest book that wowed me was GONE GIRL. Holy cow, it was amazing and so well written and packed with twists. Crazy but good. YES! This. And I don't know why, but sometimes I resist reading a book. For instance, I bought a book in september, started reading it in October, but barely got anywhere with it. Then in November (yeah, sometimes I go SLOWLY), I realized that I liked it, maybe loved it. And I read the rest of it in two sittings. It was wonderful. I wish I could have savored it more, or been less skeptical at the beginning. anyhow, I loved it and I was feeling inspired. The book? Please Don't Tell My Parents I'm a SUPERVILLAIN! I mean GOLD. I spent half the book wishing I'd come up with the idea. any how. It was blast, now back to work. That book looks amazing. :) I'm always inspired by reading. My favorite books never get old, and they remind me not just of the wonderful feeling of discovering them again, but also what makes writing and reading books so awesome. My writing buddies also inspire me. I'll read their drafts and later on see their work in print. I know what you mean...it's almost like I can't enjoy a book anymore. But you know what I've found? When the book is really good, all that goes out the window and I get immersed. So, if I'm all stuck on pacing and problems with the book, noticing them instead of enjoying the read, I usually give up on the book. This is exactly me, lately! I've been so harried to finish my edits I haven't read ANYTHING for pleasure lately! But I've been feeling rushed and stumped, I decided to finally just take a day off and read and holy bananas, it made a huge difference! I read The Kiss of Deception yesterday--It's totally motivating for me and has helped. Reading really is a big deal for us writers!!! And yay, so excited about David's book!!! Lucky you to get to read Woven! I bet it's awesome! I have such a hard time finding time to read (and write). Life is just so crazy busy! I have a few authors that I wait for. I know when I get their book I can relax because I trust them. You are right reading is so important. Enjoy the book! Can't wait to read it myself. I've read quite a few inspiring stories lately from our indie author friends. They're so wonderfully talented. Like Mary Pax's Rifter series and Milo James Fowler's Coyote Cal. Such fun! cutie in the outfit! when I read "the last child" I was sold to commit to writing. it amazed me to no end. I can't wait for woven to come out you lucky girl! I know what you mean, Morgan, sometimes switching off my internal editor is almost impossible! I try and learn something from every book I read whether I have enjoyed it or not. I read to be entertained and so I try to write to entertain too. I'm sure Woven is going to be a fantastic read. After I finish this series (hopefully soon), I will definitely be on the look-out for that elusive inspiration! I've rarely had problems with inspiration, as ideas come from everywhere; it's hammering all those ideas into a story that's my issue. O_o But I know what you mean. It's hard, sometimes, to turn off the inner writer/editor and just read, without seeing the little things about a story that people who don't write would never notice. I think it's the mark of a truly good story, and a truly good storyteller, to make us forget all of that and just lose ourselves in the book. I am finished with Woven. Neener, neener. LOL. It is excellent. It is good to re-read the books that inspire us. Makes my brain sigh with awe and wonder. Love your words as they become pictures in my mind. I did notice that you didn't share the book(s) that inspired you to write.... I am curious. Love you, darling girl. I often find my inspiration for writing and speaking to come from reading from genres other than my subject. But I seldom reread books, but I might reread a part of a book. I am often inspired by the books I read. The one that comes to mind right off is Maggie Stiefvater's The Raven Boys. And yes! I'm very jealous you're reading Woven! This is spot on, Morgan. Beta-ing helps spark inspiration, and I think it can make a stronger writer with ones own work. Great post! That is how I feel. When I read for pleasure I have to shut my inner editor up because it wants to pick the books a part. I am SO excited for Woven!!! I can't wait to get my hands on it!! Going back over the books that were the catalyst of your own inspiration, is a nice, positive outcome. As for editing? What's that? Aha! See ya later, dancing, writing princess! I do love to re-read some of the books that inspired me most. Analyzing what made me love them is something I haven't yet done, but probably should. And of course I'm jealous! I like you, love to revisit a book that created this take me away feeling. I have been known to carry a book around with me waiting for a chance to read just a few lines. Love this post and thank you for sharing your 'escape into another world' feel! I hope the Sugar Plum fairy twirls in your dreams and inspires more goodness~ I have missed blogging! Thank you, Morgan-you made me smile! Awesome pic! A reader and her book! Wishing you a very Merry Christmas and a happy prosperous New Year! Great reminder that we need to slow down every now and then to find inspiration. And be inspired by stories instead of overanalysing them!